There’s a reason David calls it a “Chocolate Idiot Cake”: it’s pretty damn hard to mess up. Chocolate and butter are melted in one bowl. Eggs and sugar are whisked in another. The two are then whisked together. 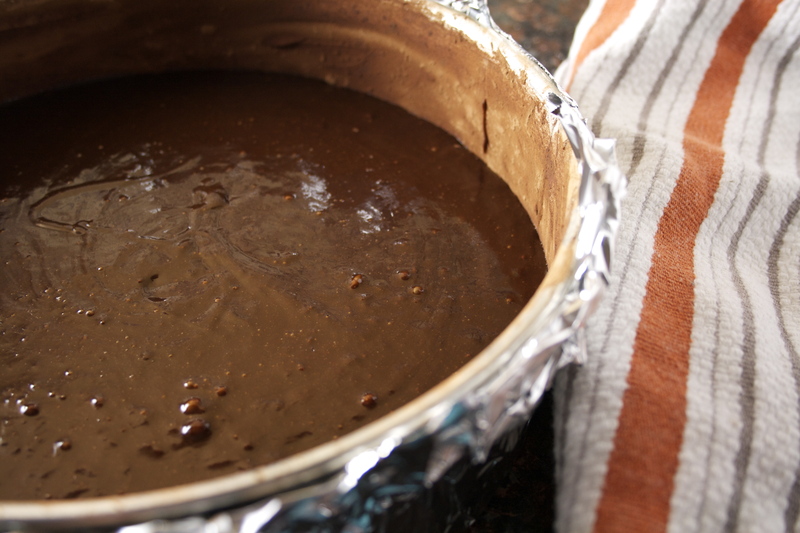 Poured into a buttered and cocoa-ed springform pan and baked in a water bath and you’re done. When it was cooled, transported, and we were ready for dessert, I easily released the sides of the pan from the cake. The top was so gorgeous, shiny, and slightly swirly, that I decided not even to bother flipping it and dusting it with cocoa powder, as I had planned. 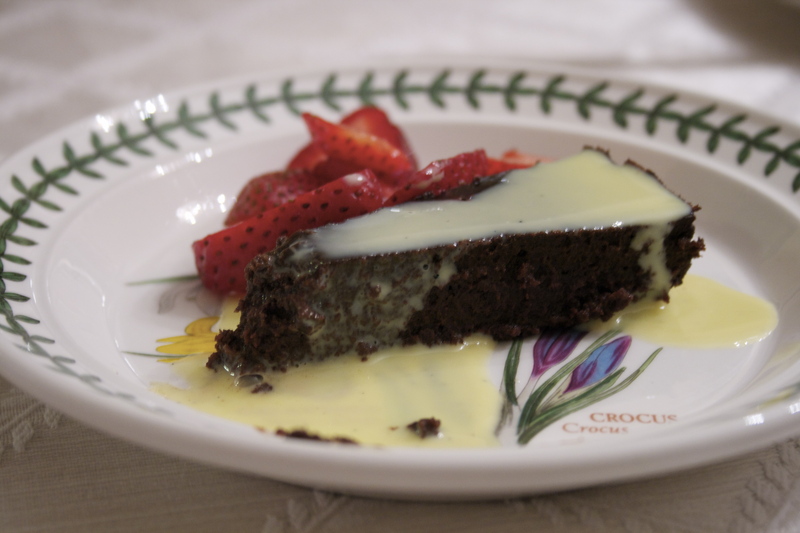 I served it with a silky crème anglaise and sliced strawberries, as an homage to my grandmother (whose birthday was always around Passover and which we used to celebrate with a Passover sponge cake, strawberries, and whipped cream) and to cut the supreme richness of the chocolate cake. I let everyone else at the table who wanted a slice dig in before I took one, and even before I poured my crème anglaise on my own slice, I heard my family swoon. Even my cousin, an amazing baker and cook in her own right, who is a chocolate perfectionist, called down the table how amazing it was. If it won her over, it was a keeper. The texture of this flourless chocolate cake is divine. I thought it would be more like a ganache than it is — but it has substance. It melts in the mouth, but it still has heft. It’s rich without being too sweet. And it needs no internal embellishments — no coffee, no liqueur, no spices. Just pure, simple chocolate. Finally, an amazing recipe for all Passovers henceforth. An amazing recipe to feed a gluten-free crowd. An amazing recipe for a romantic dinner at home, a birthday for my mom, a celebration with friends. 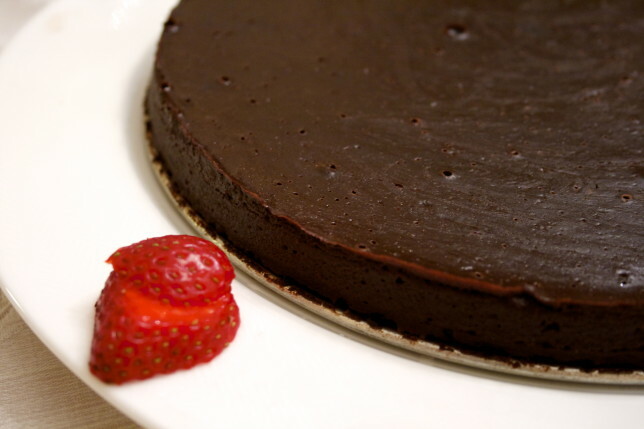 A rich, silky, satisfying flourless chocolate cake for all occasions, for all seasons. And for that? I won’t apologize. I agree with David that it’s pretty important to use good chocolate if you can, since it is in essence what the cake is, simply built up with eggs, butter, and sugar. And definitely do wrap your springform pan in at least a couple of layers of foil to prevent any water from getting in. Wrap it tightly! Preheat oven to 350 degrees. Butter a 9-inch springform pan and dust it with cocoa powder, tapping out any excess. Wrap the outside of the pan well with foil. In a double boiler or in the microwave on half power in 1-minute increments, melt the butter and chocolate until almost completely melted. Stir occasionally until smooth. Set aside and let cool slightly. 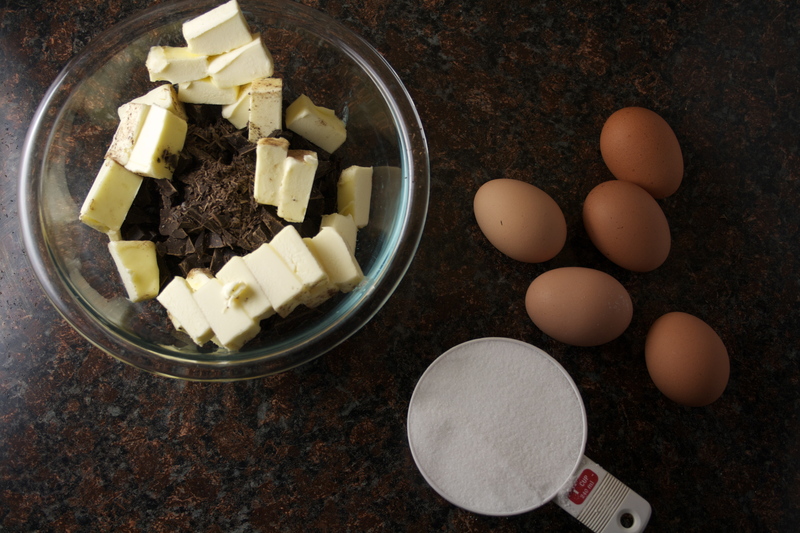 In a large bowl, whisk together the eggs and sugar until combined. 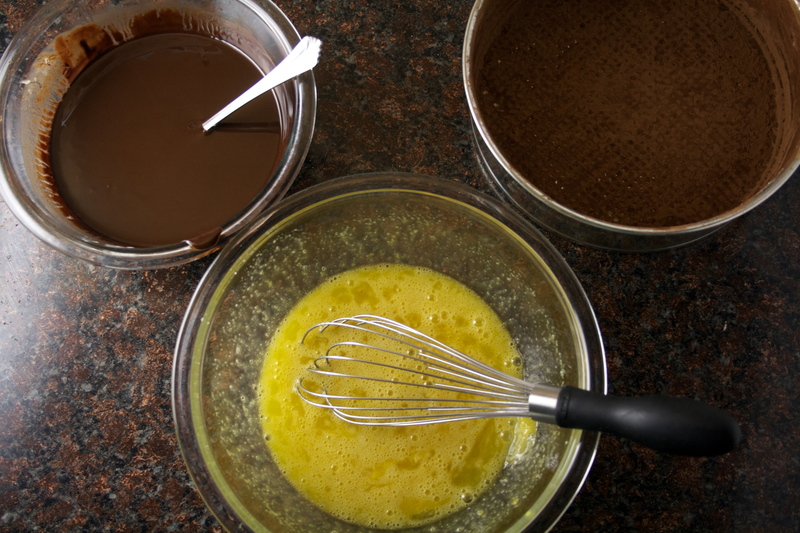 Whisk in the chocolate mixture until smooth. Pour the batter into the prepared pan and cover it tightly with a piece of aluminum foil. Place the pan in a roasting pan and pour in hot water, creating a water bath, filling it until water comes about halfway up the sides of the springform pan. Bake for 1 hour and 15 minutes. The top will be shiny and just barely set. 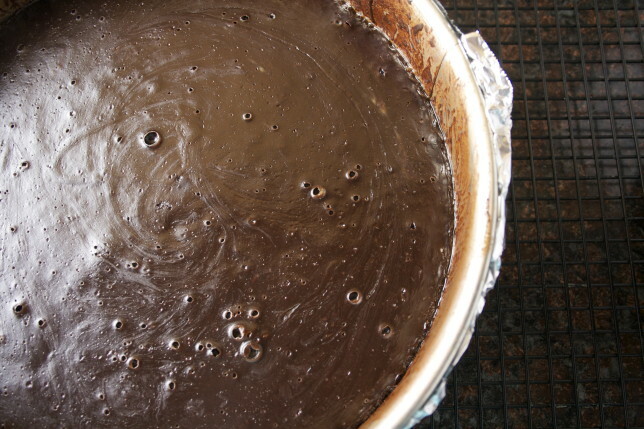 Lift the cake from the water bath, remove the top piece of foil, and set on a wire rack to cool. Serve at room temperature with crème anglaise and fresh berries. This looks delicious! 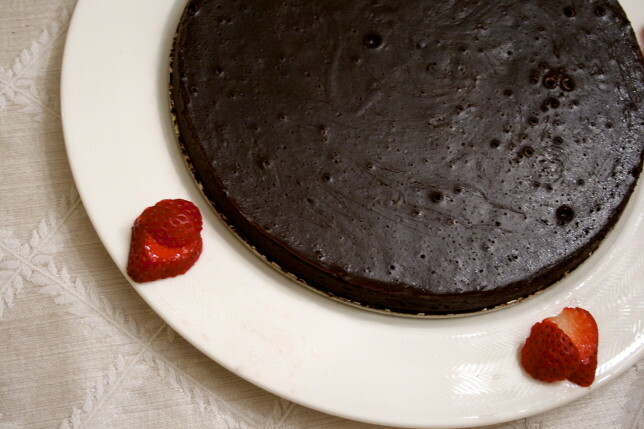 I have also made a flourless chocolate cake for a Passover seder, but I cheated since I didn’t use chocolate that was specifically Kosher for Passover. So, do you bother with finding Kosher for Passover chocolate for this cake? Or does most chocolate already fit that category (I have no idea)? Thanks! Honestly, my family isn’t that strict, and I’m not sure it really matters so long as it doesn’t have anything like corn syrup in it — and most good chocolates shouldn’t! Hope this helps!